Custom Network Rack specializes in rack mount solutions for network, IT and security infrastructure. We have an extensive knowledge base for 19 inch rack enclosures, wall mount cabinets, 4-post server enclosures, rack mount shelving and components, thermal and wire management, and LAN station IT workbenches. We also stock many different kinds of fiber optic, Cat5e/Cat6 Ethernet, and power cables. 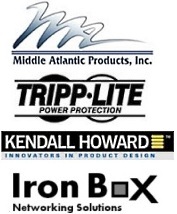 We have partnered with Kendall Howard and Middle Atlantic to give you the most durable and innovative rackmount products available. Both Kendall Howard and Middle Atlantic stay on the bleeding edge of innovation in the server, network, datacom, security, and IT markets, always striving to improve the functionality and durability of every product they manufacture. Everything is made in America, so you can be sure that you're receiving a quality heavy-duty product with American ingenuity at a competitive price. All in stock products ship within 24 hours. If you need help putting together a custom rack system, or have any other general or technical questions, please call us at 1-800-406-8520 or email us at sales@customnetworkrack.com. We are fully committed to giving you the best, most helpful service and lowest prices anywhere on the web each time you order.